AMES, Iowa—Chrysanthemums reach their peak when most annuals and perennials are winding down for the season. Mums offer gardeners a wide range of colors and flower forms and only require moderate maintenance. 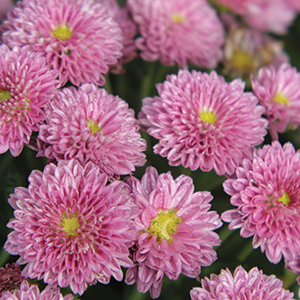 Iowa State University Extension and Outreach horticulturists tell how to get the most enjoyment out of mums. Gardeners with additional questions should contact Hortline at hortline@iastate.edu or 515-294-3801. Will fall planted mums survive the winter? Unfortunately, fall planted mums usually don’t survive the winter. Flowering mums purchased in late summer or early fall should be regarded as annual additions to the landscape. Spring is the best time to plant mums in Iowa. Spring planted mums have the entire growing season to get established and usually survive the winter much better than those planted in fall. When purchasing plants, be sure to select hardy, garden mums. How should I prepare mums for winter? Chrysanthemums are shallow-rooted plants. Repeated freezing and thawing of the soil during the winter months can heave plants out of the ground and cause severe damage or even death. Gardeners can increase the odds of their mums surviving the winter by applying a mulch in fall. Mulching helps eliminate the alternate freezing-thawing cycles that can heave plants out of the soil. Apply the mulch in late fall, typically late November in central Iowa. Do not cut back the plants prior to mulching. Simply cover the plants with several inches of mulch. Suitable mulching materials include clean (weed-free) straw, pine needles and evergreen branches. Leaves are not a good mulch as they tend to mat down and don’t provide adequate protection. The mulch should remain in place until early April. I recently received a flowering mum from a floral shop. Can I plant it outdoors? Florist or greenhouse mums are sold throughout the year at floral shops, supermarkets and other retailers. Unfortunately, florist mums do not perform well when planted outdoors. Most florist mums will not survive the winter when planted outdoors in Iowa. Those florist mums that manage to survive the winter typically don’t bloom outdoors. Florist mums bloom late in fall. Oftentimes freezing temperatures destroy the flower buds before they are able to fully develop and open. It’s usually best to toss a florist mum into the compost pile after blooming. If you would like to plant mums in your garden, purchase hardy, garden mums at a local garden center in spring. Garden mums are more cold hardy than florist mums. They also bloom earlier than florist mums.